Though Las Vegas is most definitely considered a “Western” city, the chance of seeing a real live cowboy is pretty slim. Sin City is more of an entertainment mecca than it is a southwestern oasis; so if you ever wanted to experience what it’s like to be a cowboy, you’d typically have to travel a little further south. There’s one establishment in town, though, that’s made it all-the-more possible to get that feeling that you’ve entered into a true western establishment without having to deal with the smell of cows and other livestock. Built as part of Wildfire gaming, Wild Wild West Hotel and Casino breathes some of that old western style in Sin City. Located just minutes from the Strip, Wild Wild West offers a great alternative for when you’re not looking to spend a bulk of your vacation money on rooming accommodations. 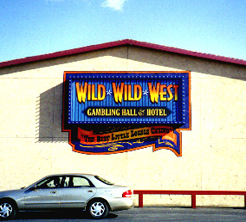 While you won’t find the same quality of furnishing as you would in an expensive Las Vegas Strip, Wild Wild West offers the same basic amenities that you’d find in any normal hotel. You’ll be able to bypass all the glitz and fluff of an on-the-Strip establishment and get the basic amenities that you’ll need for your stay in Las Vegas. Included in Wild Wild West’s 260 impeccable rooms, which are owned and operated by Days Inn, are 4 deluxe suites that stretch far beyond this companies norm. With a view that overlooks the refreshing pool, these 4 suites offer over 400-square-feet of space, along with free Wi-Fi and 42” flat screen TVs. Very few people come to Las Vegas to enjoy the room and board, though - and a quick look at what Wild Wild West has to offer shows that there’s more to this smaller establishment than just comfortable accommodations. The biggest drive to Wild Wild West is going to be its extensive assortment of nearly 200 of some of the loosest slots in Vegas, a convenient sports book, and exhilarating table games. 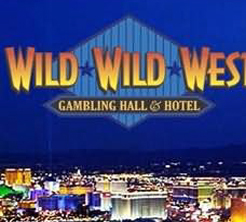 At Wild Wild West, you’ll be able to experience the gambling atmosphere of Sin City without having to deal with the large crowds of most major hotels and casinos; and if you’re ever in the mood to travel to the Strip, this establishment’s close proximity makes it easy to hop on a local bus line, hail a cab, or travel their yourself in your rental car. At Wild Wild West, on top of the gambling scene, you’ll get everything you need to survive during your stay. 24-hour dining is available at the on-site Denny’s while the pool at the Days Inn hotel allows you to sit back and relax in the warming desert sun. After a long hard day of throwing your money away at the electronic machines, everybody needs those moments of relaxation that the Days Inn pool and rooms provide. Don’t get too comfortable, though. There’s no excuse for sleeping through all entertainment fun that Sin City has to offer. 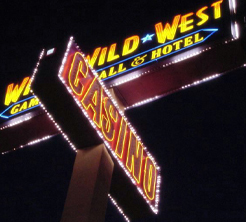 Wild Wild West Hotel and Gambling Hall is just one of those ideal locations that let you bypass the expensive resort fees and overpriced room service without sacrificing basic quality. Think about it - do you really want a major portion of your traveling budget to go towards the room itself?